Real estate represents an increasingly significant global asset class and its distinctive characteristics must be understood by investors and researchers. 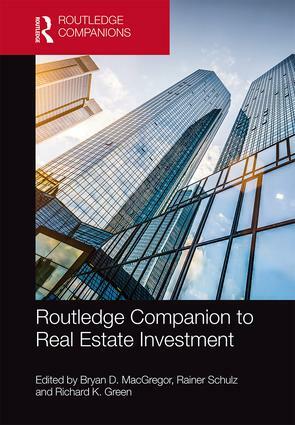 The Routledge Companion to Real Estate Investment provides an authoritative overview of the real estate asset class. The Companion focuses on the current academic research and its relevance for practical applications. The book is divided into four parts, each containing specially written chapters by international experts in the relevant field. The contributors cover the institutional context for real estate investment, the main players in real estate investment, real estate appraisal and performance measurement, and real estate portfolios and risk management. This Companion provides a comprehensive reference for students, academics and professionals studying, researching and working in real estate investment, finance and economics. Bryan D. MacGregor is the MacRobert Professor of Land Economy and Executive Dean at the University of Aberdeen Business School, UK. He is editor of the Journal of Property Research. Rainer Schulz is Senior Lecturer in Real Estate at the University of Aberdeen Business School, UK. Richard K. Green is the Director of the University of Southern California’s Lusk Center for Real Estate. He holds the Lusk Chair in Real Estate and is Professor in the USC Sol Price School of Public Policy and the Marshall School of Business.